In 1951, George and Heather Greenup could see that their commercial herd of Shorthorn cattle was being outperformed by their neighbour’s Herefords. 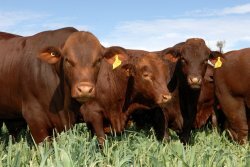 In a search for better cattle they discovered the new breed Santa Gertrudis. After coming home empty-handed from the first King Ranch Sale at Risdon in 1952, the couple returned to the second King Ranch Sale and purchased the bull KRT Elation 35(Imp.) for $1,500. Aged 18 months, Elation was mated to 16 selected red Shorthorn cows, with the first calf arriving on December 2, 1954. The quality of these calves surpassed all expectations. The first crossbred calves looked so good that it was decided to use the bull calves in the remainder of the Shorthorn herd. As well as this, a number of progressive cattle breeders showed interest in using these bulls. Within a couple of years George and Heather were breeding a number of bulls and looked for a means of marketing them. 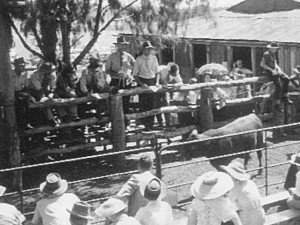 In those early days, stud bulls were sold at the Brisbane Royal Show. This was not an option for the Greenups as the bulls they had for sale were not purebreds. 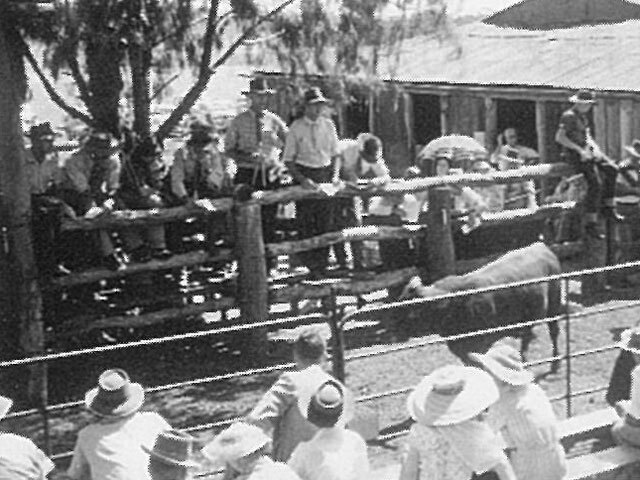 Despite advice from the Department of Primary Industries that the “first-cross calves would be of no benefit to the cattle industry and should not be sold”, the inaugural Rosevale Sale was planned for November 18, 1957. The catalogue consisted of 16 Santa Gertrudis/Shorthorn cross bulls aged 12-16 months and one purebred Shorthorn bull. Private sales of 5 bulls to Mr Jim Fea from Goondiwindi and 7 bulls to a cattleman from Roma took place prior to the sale. By arrangement with King Ranch, Mr Fea’s bulls were taken to “Risdon” for display at the 6th King Ranch Sale on November 15, 1957. Our agent, George’s cousin and long time family friend, Mr Geoff Bassingthwaighte of Jandowae, talked about the bulls and advertised the Rosevale Sale for the following Monday. Buy he certainly did – three bulls in total, including two for the top price of $840. The first sale was a modest affair. Iron gates were wired across the horse-yard to make a ring, while 400 visitors found positions on yard fences and stools borrowed from the local hall. Prior to the sale the buyer from Roma had decided not to take his seven bulls. These bulls were held in reserve behind the hill in case the sale was good. After a few lots, Jenny Greenup (aged 11) and an old drover, Bob Kay, went to get the reserves in. A total of 23 bulls sold to average $533. By comparison, a good roan Shorthorn bull sold on the same day for $73. The success of this first sale convinced George and Heather to commence a stud – something they had not previously intended. Geoff Bassingthwaighte presided over the first twelve sales as chief auctioneer and agent. His input was invaluable and his close relationship with George and Heather made the experience a fruitful and enjoyable one for all concerned. KRT Elation 35(Imp.) died in 1969 aged 16 years. He sired 575 calves, all by natural service. Because few purebred cows were available, he only sired 20 purebred bull calves and 15 purebred heifers. 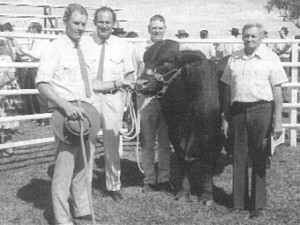 Most notable of these was Rosevale Elation 17 who was judged Junior and Grand Champion at the 1967 Brisbane Royal Show. Because of Elation’s fertility, longevity and breeding consistency, his influence was evident for decades in the herd and was instrumental in shaping the “Rosevale type” – well muscled, easy doing, early maturing cattle. The success of the early sales was very gratifying for the family. Much of the enjoyment would have been fuelled by comments of the many doubters in the early days of the breed – especially those aligned to British breeds. History shows that even the crossbred bulls improved calving percentages and growth rates in the herds they were used in. The 9th Annual Sale, held in 1965, saw the first two purebred, classified ‘S’ bulls sold at Rosevale. Both were graded-up descendants of the Shorthorn cows and sold for $1,890 and $1,995. The top price was the highest price achieved at Rosevale at the time and was paid by Mr Jack Mulholland. The 12th Sale in 1968 was a record breaker for the Stud. A total of 41 bulls sold to average $1,556 and topped at $8,000. The top priced bull, a son of Elation, was purchased by Mr Arthur Daniells from Gayndah. With the Beef Industry booming, the 17th Sale in 1973 saw 71 bulls set a record average of $1,766. Rosevale Elation 384 became the highest priced bull sold at Rosevale to date when purchased by Mr Jack Mulholland for $10,000. The buoyant market displayed in the results of the 1973 sale gave no indication of what was to come. A combination of a number of market forces from overseas countries caused a decline in demand for Australian beef resulting in what was termed the “Beef Slump”. The market for commercial cattle was severely depressed which resulted in low bull prices. 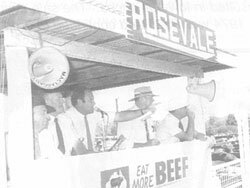 The sale average bull price at Rosevale in 1974 was $529 and continued to drop until the 21st Sale in 1977 when 72 bulls sold to average $314. With an additional 73 heifers sold on that day, the entire draft grossed $28,320! The sale results prior to, and including the 1977 Sale could have been worse if it wasn’t for the bulk buying support of King Ranch subsidiary companies Queensland and Northern Territory Past Co. (QNTP) and King Ranch Past. Co. (Brunette Downs). 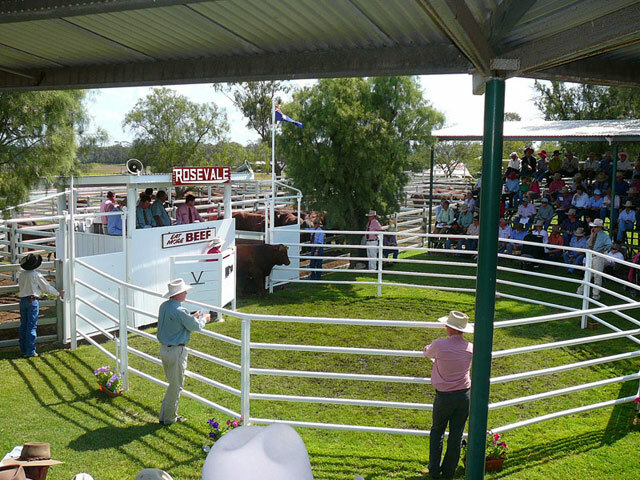 Under the direction of Mr Arthur Bassingthwaighte, the companies purchased a total of 586 Rosevale bulls over a period of eighteen years, both privately and at the annual sales. In 1978 the sale average price rose to $901 and further increased to $1,547 the following year. Of interest is the ages of the bulls sold through the years. Yearlings were sold up until 1962 when two-year-olds were offered. By the early 1970’s three-year-olds began to be offered with bulls as old as four years being offered between 1974 and 1978 – possibly due to a lack of demand through this period. From this point on, three-year-olds dominated the catalogues until 1989. In the early 1990’s a few more two-year-olds were included and it wasn’t until 1996 that the entire offering were two-year-olds (apart from those three-year-old bulls used as sires the previous year). 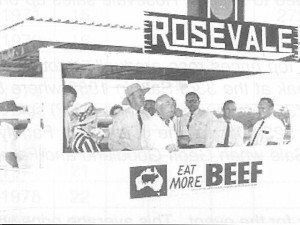 Sale 27 in 1983 was significant in that the Greenup Family celebrated 100 years of ownership of “Rosevale”. George Greenup’s Grandfather, George Bassingthwaighte, had owned and managed “Rosevale” before George and Heather took up residence following his death in 1944. Sir James Ramsay, the Governor of Queensland at the time, was the guest of honour at the sale. The top priced bull of the day was sold to King Ranch (Tully River Station) for $10,000. Between 1971 and 1990, Mr Les Camm put a floor in the market at Rosevale purchasing a total of 175 bulls. His family-run company, now in the hands of David and Judy Camm, has continued to support Rosevale sales up until the present day buying a further 37 bulls. Sale averages and top prices rose gradually through the 1980’s and hit a peak at the 33rd Sale in 1989 where 85 bulls averaged $3,735. Rosevale Domingo N3(P) sold for the top price of $23,000 to the Ciesiolka Family’s Valleyview Stud. This sale top price was not equalled until the 48th Sale when Geoff Goodland and Family purchased Rosevale Francesco Y36(P) for the same amount. At the 40th Sale in 1996, 90 bulls averaged $4,083 – a new benchmark for the event. This average price was bettered in seven of the nine sales that followed including Sale 45 in 2001 where 129 bulls averaged $5,825. At the 49th Sale held in 2005, which featured the first sons of Tyndale Noddy(P), all Rosevale records were broken. 128 bulls sold to average $6,047. 19 sons of Noddy sold to average $14,184. These included Rosevale Zurich Z48(P) who sold for $40,000 to Robert Adams and Family from the Dangarfield Stud. It is interesting to note that in the pedigree (seven generations back) of Tyndale Noddy(P) appears a bull by the name of KRT Elation 35(Imp.). The strength of the sales from the early 1990’s for more than a decade was fuelled by strong demand from large pastoral companies including Australian Agricultural Co. and S.Kidman and Co. The 50th Annual Sale was a grand occasion with an extremely large crowd attending. A record sale gross of $887,000 was achieved with 144 bulls selling to average $5,941. On the occasion of the 50th Annual Rosevale Sale stud co-principal Grahame Greenup said “It is a tremendous honour to achieve such a milestone and particularly satisfying to know that four generations of our family have been involved in the development of the herd from the beginning until now. As part of a family succession plan, Rick and Alice Greenup registered their own “Greenup” Stud in 1999, based on Rosevale females. In 2002 the final share of the Rosevale herd was transferred to the Greenup Stud. 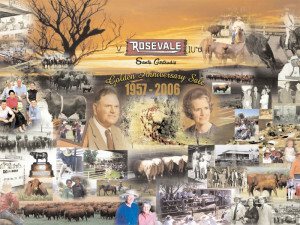 Rick and Alice continued to sell bulls at the Rosevale Annual Sale until the 50th Sale in 2006. From this time on they have marketed their bulls through their own production sales. A record sale bull average price was recorded at Sale 51 in 2007 where 117 bulls sold to average $6,423. Following up from the strong sale in 2007, the 2008 sale again averaged high at $6,314. The highlight was the sale of Rosevale Ambassador A26(P) (another son of Tyndale Noddy) to the Wainwright Family’s Bremervale Stud. The four-year-old, proven sire weighing 1,245kg was the top selling Santa Gertrudis bull in Australia for the year and created a new Rosevale record high at $60,000. Repeat clientele are a feature of Rosevale sales through the decades. 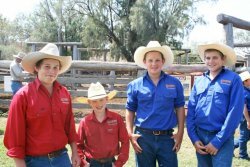 Successful family businesses who have purchased more than 50 bulls include Paul and Tim Kirkwood and Family, Don and Jan Ross and Family, Noel and John Howard and Family and Lance Dunlop and Family. Sale 53 in 2009 was tremendously solid with a sale bull record average set at $6,800 for the 118 bulls sold. In 2010, legendary auctioneer Garth Hughes held the gavel at Rosevale for the 40th and final time. Garth retired after a distinguished career in the agency business of over 50 years. The Greenup Family regard it as an honour to have had a person of such renowned ability performing this task for them for so long. 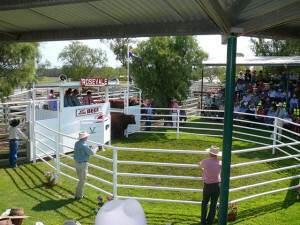 In 2011 a record sale gross of $928,250 was achieved for an offering of 132 bulls (@$6,644) and 17 females (@$3,014). Rosevale Buster F236(P) sold to the Strathmore and Bendalla studs for an Australian Santa Gertrudis top price for 2011 of $49,000. The pleasing feature of the sale was that 47 bulls sold for $4,000 or less which meant there was bulls for all budgets. This point was noted by a number of buyers who were pleased to walk away with the number of bulls they came to buy.